Hello, friends! 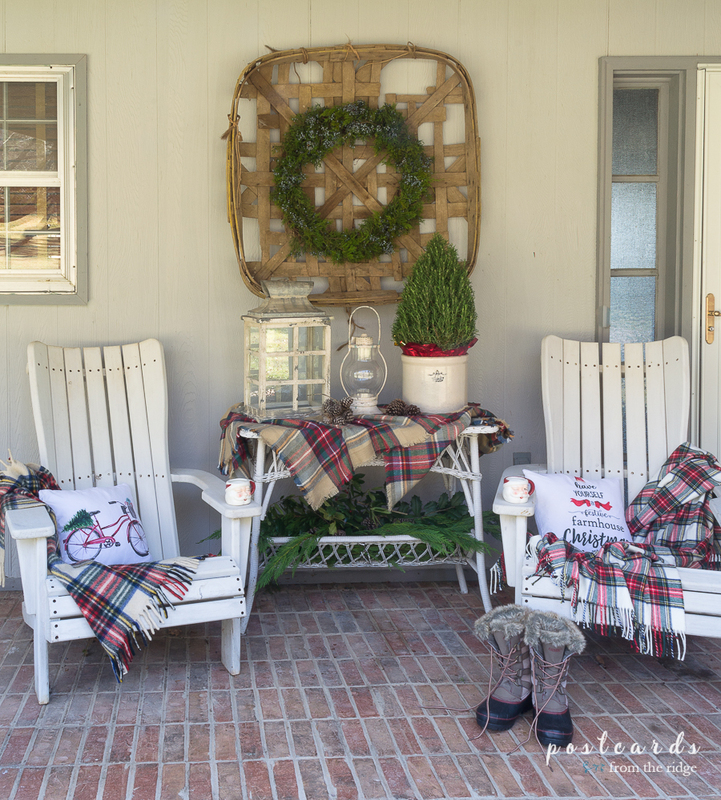 And welcome to our Christmas front porch! It's always one of my favorite places to decorate since it greets us and anyone who comes to our front door throughout the holiday season. 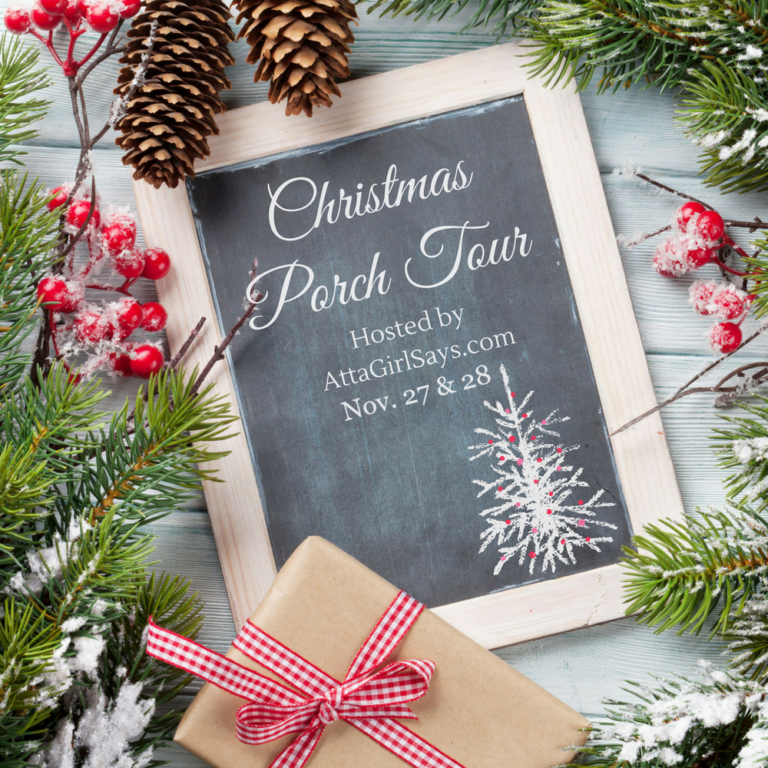 Today I'm joining with some of my super talented blog friends in a Christmas Porch Tour organized by Amy at Atta Girl Says blog. She always has the coziest Christmas front porch and the rest of her house is so warm and welcoming. Be sure to drop by and see her porch, along with everyone else on the tour. The links are at the bottom on the post. If you're here for the first time, you can learn a little more about me and this blog HERE. And you can take a tour of our home HERE. Welcome to our front porch! 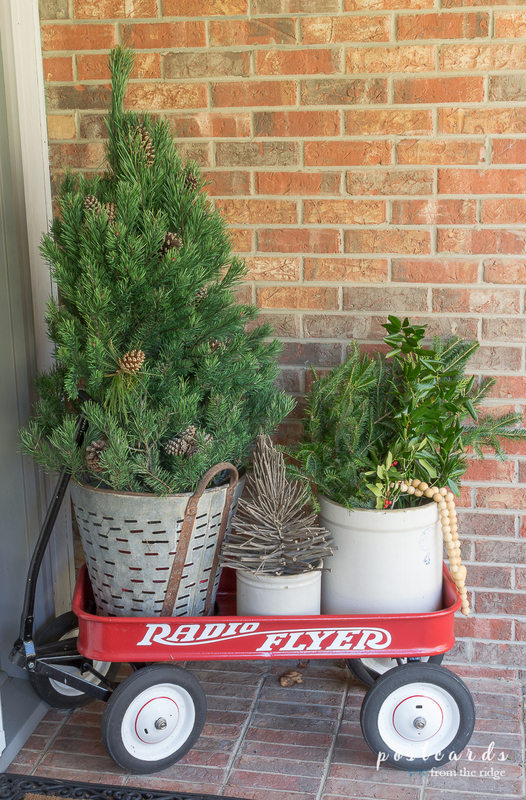 It wouldn't be Christmas here without my dad's restored old Radio Flyer wagon. 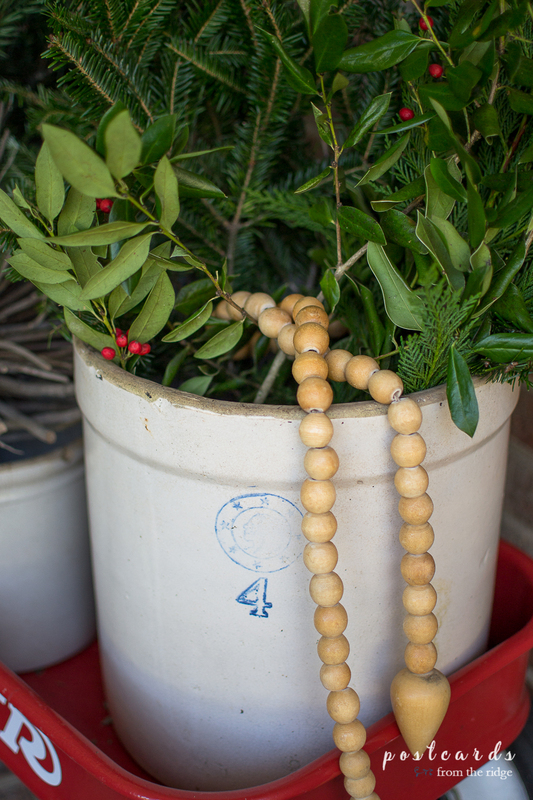 This year in the wagon I have a tree in our vintage olive bucket. And I added a couple of vintage crocks filled with evergreen branches and a little twig tree. I bought the live tree a few days ago and tucked some pine cones inside some of the branches for a little more of a woodsy look. I like to use natural elements on the porch whenever I can. Here's a view of the entire porch. Our Adirondack chairs, the wagon, table, and vintage tobacco basket stay out here all year round. I switch out the decor for each season. One thing I changed this year was our hanging lights. Just before Thanksgiving, I had our old 1964 lights changed out to the black lanterns. Such a little change but it looks so much better! I made a large wreath to hang on our vintage tobacco basket. 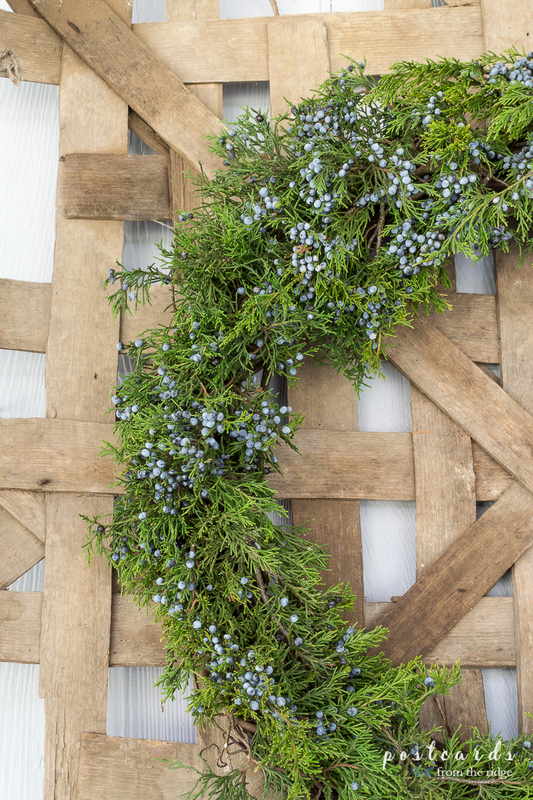 It's simply cedar branches with berries tucked into a large grapevine wreath. Rustic, simple, and natural. Perfect for a porch! 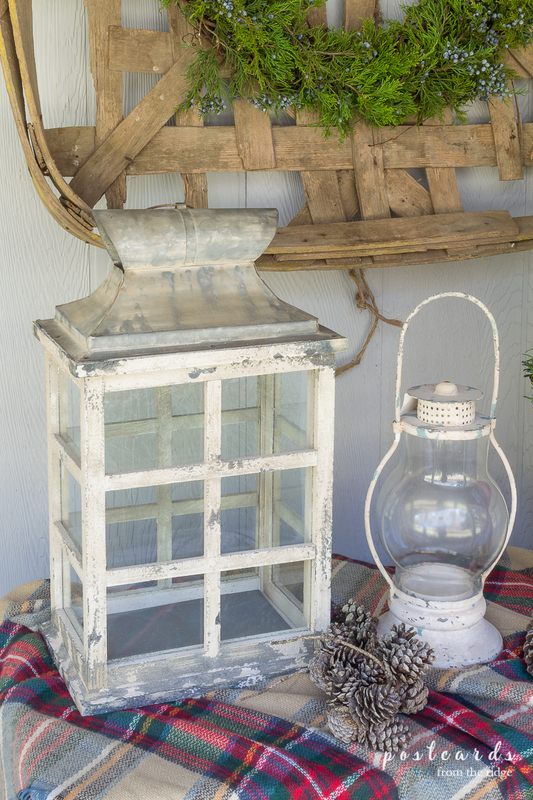 Some rustic lanterns from my shop decorate the old wicker table. 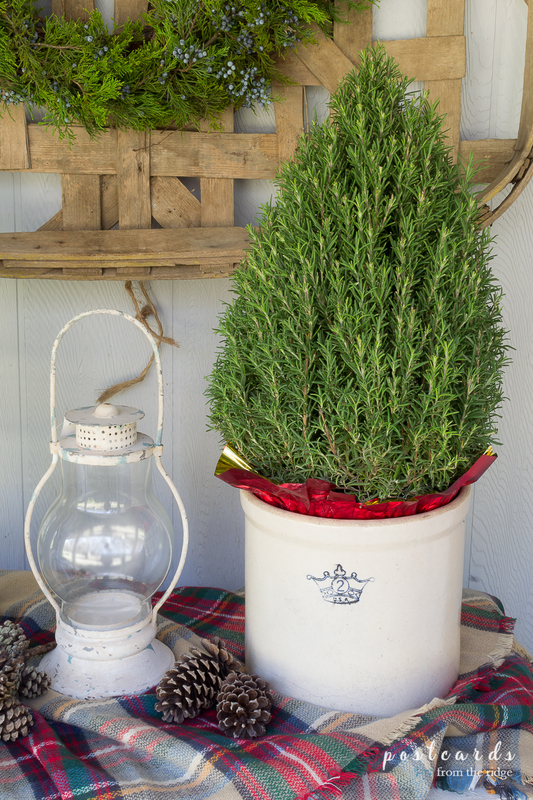 And this rosemary tree looks just like a Christmas tree. 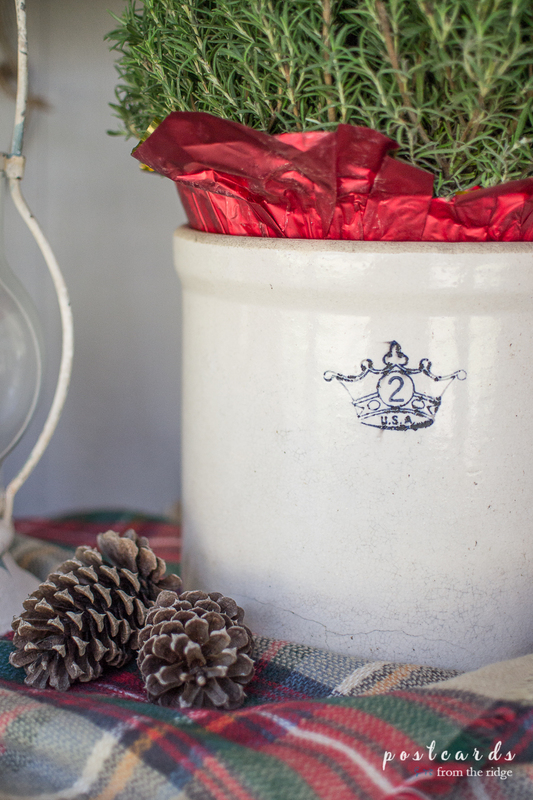 I placed it in one of my vintage crocks for a festive addition to the table. A plaid scarf makes a simple, fun table cloth. On our chairs, I added some fun pillows from my shop, Emory Valley Mercantile. They add a bit of whimsy to the porch and make me smile every time I see them. And my favorite Santa mugs are perfect for hot cocoa or tea. 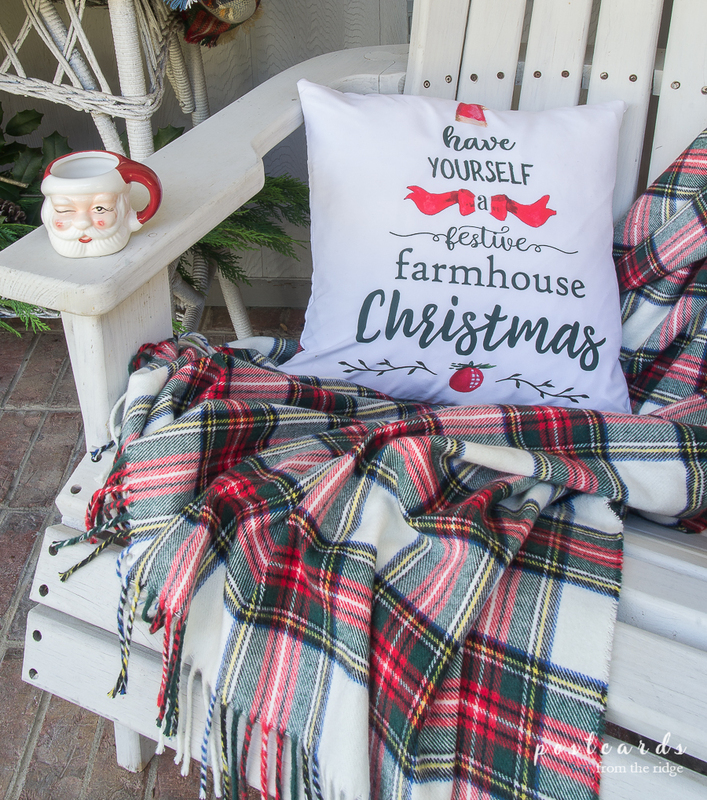 Are you ready to sit a spell with me on our cozy porch? Now I invite you to visit all of my talented friends. Prepared to be inspired with these festive Christmas decorating ideas for your front porch, sunroom, screened-in porch or gazebo. 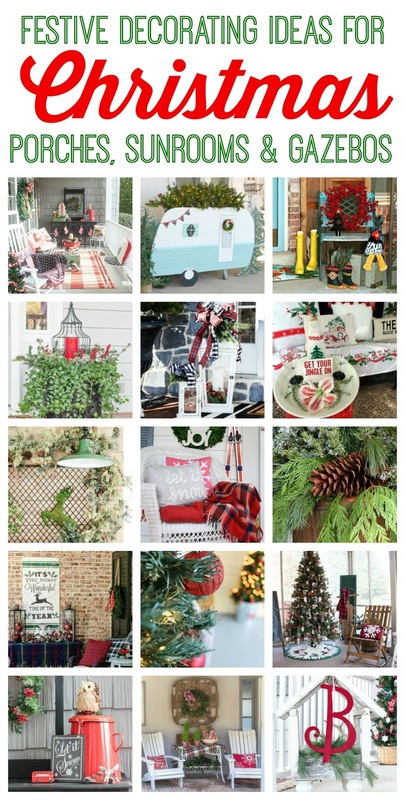 I hope you've gotten lots of great ideas for your outdoor decor! Happy decorating! Coming up, an inside tour of our Christmas decorations for this year including my recently painted fireplace and mantel. Subscribe to email updates below so you don't miss it or any upcoming posts! 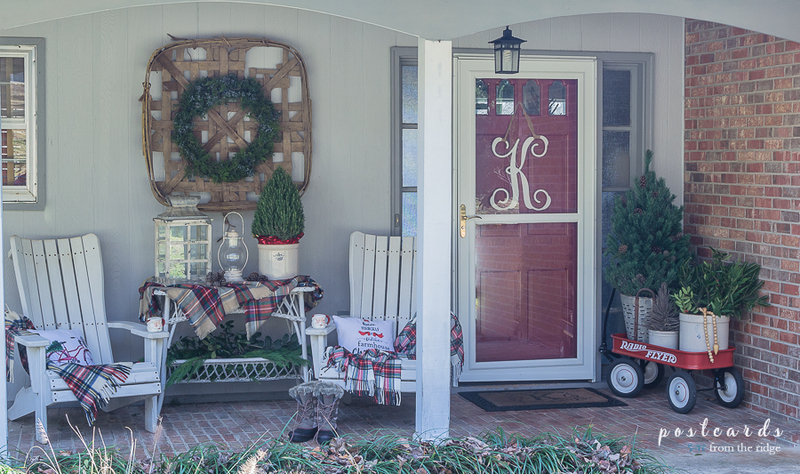 Your porch looks so pretty and inviting all decked out for Christmas. 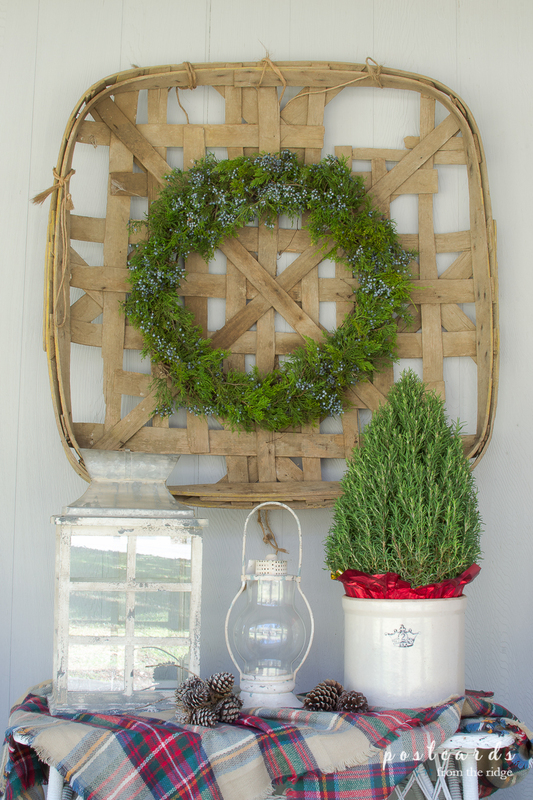 I love how your tobacco basket stays in place year round and creates a backdrop for a seasonal wreath. And speaking of wreaths, you wreath filled with Cedar is so pretty. I've been looking for Cedar trees with berries on my dog walks. It's funny how one year a tree will be filled with berries and then the next have very few. The one that I usually take cuttings from for wreaths has no berries this year, so I'm on the hunt for another. 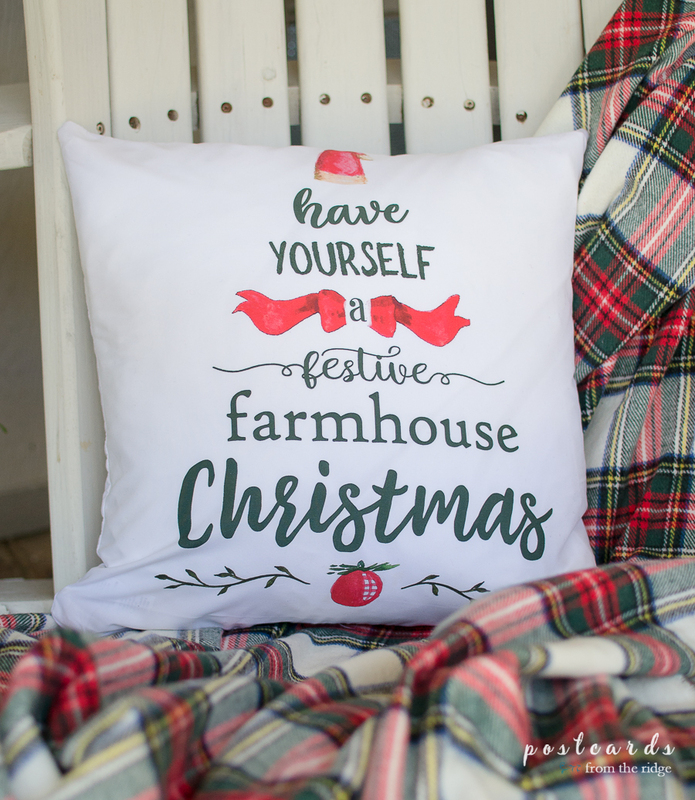 I'm looking forward to seeing more of your Christmas decor! That's it. I HAVE to buy me a tobacco basket! 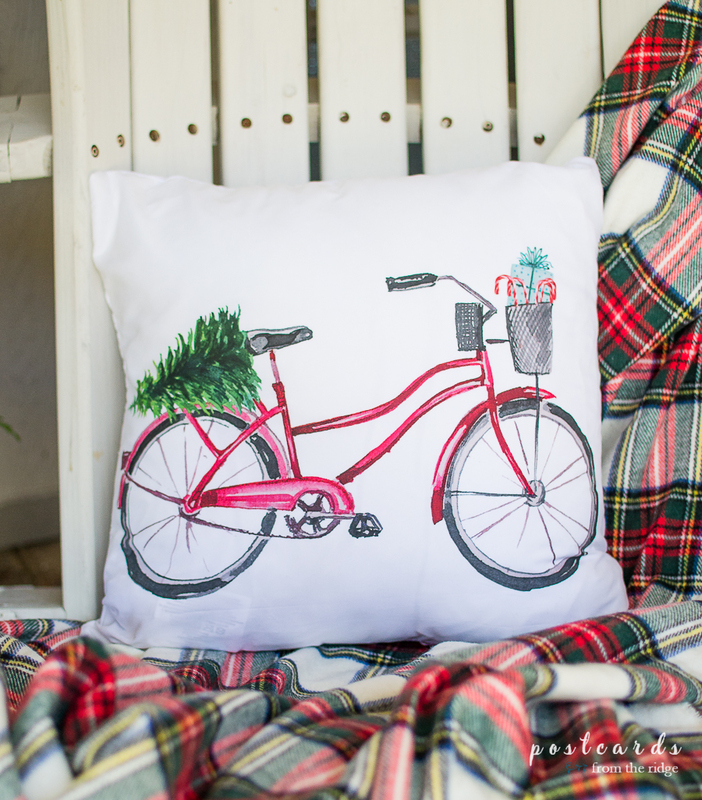 Your whole porch is so cute, but especially love to sitting area with those cute as can be pillows. Angie, your porch is amazing! I love it all! Perfect for the holidays! What can I say? I just love this space, and every year, you do it even better. Those crocks are gorgeous; I think they're my favorite element. But I also love those lanterns and the bicycle pillow. Going to check those out in your shop. This tour is suddenly getting very expensive for me! Thanks so much for being a part of it again.